North Cross Shaft, top, East view. North Cross Shaft, top, East view. 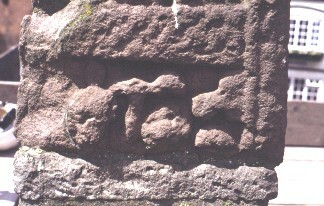 The cross is dated to the early ninth century. This panel at the top of the shaft has been identified as the Baptism of Christ (New Testament, Matt. 3; Mark 1; Luke 3; John 1:32), although it is difficult to see. Bu'Lock, J .D., Pre-Conquest Cheshire, 383-1066 1st, Cheshire Community Council, Chester (1972) Stones, Anglo-Saxons, England -- History..